Elbow pain can have many causes. Elbow pain is the type of condition that can have many causes. 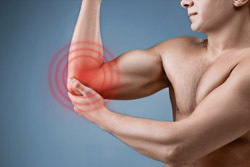 Any discomfort felt in the elbow region is elbow pain. Some people feel pain all the time while others only feel pain during physical activity. It is important to see a sports medicine professional if the pain lasts more than a few days. There are multiple causes associated with pain felt in the elbow. For instance, a patient may have a dislocated elbow. That can happen due to impact sports injuries or a massive fall. But the more common causes of pain are sprains, strains, and fractures to the area. What are the symptoms of elbow pain? The symptoms may vary based on the cause of pain. A dislocated elbow will cause pain the moment it happens while the pain from a strain or sprain may get worse as the injury gets more severe. Similar to a dislocated elbow, if there is a fracture in the area a patient will feel pain the moment it happens and the extent of that pain will be a lot more than a simple strain or sprain. The treatment for such an injury depends on the cause. That is why it is so vital to get checked out by a doctor and get the proper sports injury treatment. If you first experienced pain, avoid activity that could aggravate the injury for a few days. If it gets better, it may have been a minor impact injury but if the pain continues or returns the moment you start playing sports or training again, it is time to seek sports medicine treatment.